Getaway Day in Eugene after a rough extra innings loss in 11 frames last night – the fifth-straight loss in extras by the Hawks since June of 2013. Great game for Kevin Brown with a pair of doubles (3-for-5), with Justin Marra driving in three in his debut in the No. 3 slot in the order. Tyler Ihrig settled down after a rough first inning, fanning seven in six innings of work. Couple things I noticed over the last two days in Eugene… 1 – the PA announcer at P.K. Park keeps referring to the Hawks as the Boise State Hawks (not sure why – though I think the BSU admissions staff must love it)…2 – the music man plays songs that has questionable lyrics after 6 p.m. (forcing me to dim the crowd mic – or the FCC might be calling me)…3 – every time the horn bellows for CHARGE…it is followed by the sound of someone blowing on their arm (it’s comical the first time, not the fifth) – I don’t think these things would never had happened at Civic Stadium; 4- Gas prices are much higher than in Boise (whereas last season they were 20 cents cheaper), with unleaded at $4.03. PreGame Meal standings after 7 games – Chicken Strips/Burgers 2, Hot Dogs, Cheesesteak, PB&J 1. 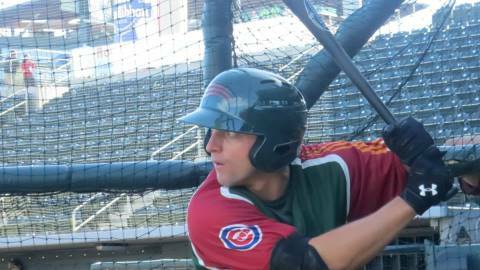 Roster moves followed the game last night – as David Bote got the call up to Kane County, while Scott Frazier has been optioned to Mesa to work on his command in the Arizona Rookie League. Three players have joined the team – catcher Erick Castillo (hit .258 last season in Mesa); infielder Alex Tomasovich of Charleston Southern (where he hit .361 with 5 HR and 44 RBI); and outfielder Charlie White of Maryland (.284 2 HR 29 RBI, 26 SB – who caught a lot of attention during the Super Regionals against Virginia).